Compressor dimensions: 15.7" x 15.7" x 28"
There is no place for compromises between silent running and powerful compressors as Silentaire Technology can provide you with air compressors combining both high working capacity and very quiet operation like this Silentaire Sil-Air 50-24-V. Many years of experience, coupled with modern production methods, allow the manufacturer to develop the most efficient, quiet, and quality air compressors on the market. For your convenience, the company produces several product lines developed specifically to fit exactly your application. Among Silentaire compressors, you can find oil-lubricated as well as oil-free units that are capable of coping with the most intricate tasks. On top of that, their moderate prices and intuitive design can pleasantly surprise you. When it comes to airbrushing, you'll probably go looking for a solitary and quite distant place. Because airbrush compressors are just used to be noisy. But you don't have to do this. Silentaire Technology knows how to make your work easier and more enjoyable. Its product range includes a number of Sil-Air quiet compressors providing silent running and completely automatic operation. To put it simply, your Silentaire compressor regulates and manages an operating process on its own. In other words, you won't need to control the level of air pressure within the compressor tank in order to avoid its overheating. That is you can pay better attention to your project rather than overlook the pressure. a carrying handle or wheels ensuring extra portability. 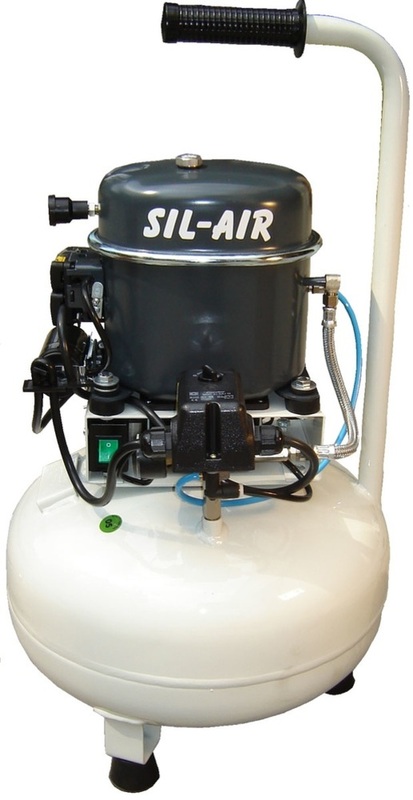 This Sil-Air 50-24-V compressor model is much alike to the Silentaire Sil-Air 50-24 Compressor except for a cooling fan for the motor. It is also quite a flexible air compressor allowing for consistent air delivery and, hence, smooth paint application. But thanks to the fan, it outperforms other alternates by its high efficiency and the duration of its duty cycle. That's why it is possible to use this airbrush compressor for larger projects. Dimensions: 15.7" x 15.7" x 28"
In addition to all that, the package also includes an oil bottle type ROLOIL - SINCOM/32E, instruction manual, and a tank certificate. The Sil-Air 50-24-V is guaranteed for 12 months from the date of purchase. Under the terms of this guarantee, you can have defective parts, except for the electric and worn parts, freely replaced or repaired. Please, do not try to do this by yourself. In case the manufacturer's authorized personnel recognizes tampering or bad usage, the guarantee will automatically cease.